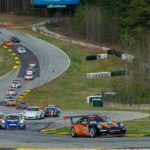 The Road Atlanta PCA race has been plagued in recent years by rain, and 2013 was not the year to break that trend. After seeing clear, cold and windy conditions for Thursday’s test day and Friday practice, dry tires weren’t used much for the weekend. Most drivers opted out of the morning qualifying session, and those who did found visibility a bigger challenge than quick laps. The weather improved as Saturday progressed, and our drivers delivered solid results. Mike Branning looked to be the favorite in SP3 class, but a transmission problem sidelined his efforts. In race group 2, Jimmy Martin avoided the wet conditions of the morning and consequently started at the back of the field for the points sprint race. Jimmy had a strong race in tricky conditions and earned a podium finish. David Baum took advantage of the last truly dry session of the weekend on Friday’s fun race, and he had a great drive running with a pair of GTC5 cars, finishing 4th overall and easily winning GTC4. Race group 3’s first sprint was run on a drying track. Bob Seitz risked going out on dry tires hoping the race would come to him in the closing laps, but sections of the track were too puddled to get adequate temperature. Mac McGehee and Cory Friedman chose the more conservative route and started the race on rains. Mac utilized his rain experience and took a top-5 In GTC4. Cory charged through the field and challenged a 997 RSR for the lead for a few laps before he sealed the deal with an exciting turn 1 pass. The second place RSR was subsequently docked 1 lap for blocking. The points sprint race 2 featured a track that was damp off-line, and that contributed to a turn 12 melee approaching the green flag. The 2nd and 3rd (behind Cory) qualifiers were taken out and evasive maneuvering put a number of cars onto the saturated grass resulting in four other cars retiring before the race even started. Regrettably, David was one of those four. After a lengthy black-flag cleanup, racing resumed and with his top competitors eliminated, Cory won with a huge margin of victory. Mac went on to finish 5th again in GTC4, and Bob took another podium in GTA2. 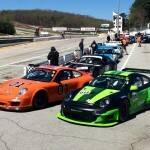 Nick Ponder making his PCA debut in GTC4 pulled off an impressive pair of class wins. For Sunday morning’s group A enduro, our CTSCC drivers Mac and David shared the ST Boxster in miserable conditions. With a goal of getting more rain experience for both drivers and testing a new defog system, the duo did a great job keeping the car pretty and ready for the Grand Am race at Atlanta next month. They also won their class in the process. The group B enduro on Sunday afternoon also took the green flag in rainy conditions. Dr Bob was the only car who stuck around for the race. The enduro immediately followed the warm-up, where Bob punctured one of his rains. We mounted up a replacement, but not in time for him to take his qualifying position on the grid. That didn’t hurt Bob much, as he ripped through the field and found himself 3rd overall as rain stopped and puddles were drying. Bob traded fasted race lap with the leaders, and when lap times showed that the rain tires had reached their limits, we called Bob in, but luck was not on our side. The 2nd place car entered pit lane, but when Bob approached turn 10, a full course caution came out and the pits were closed. Despite the disadvantage, Bob made up many positions and took the checkers 4th overall and 2nd in class. The weather presented many challenges over the weekend, but our drivers still brought home impressive results. 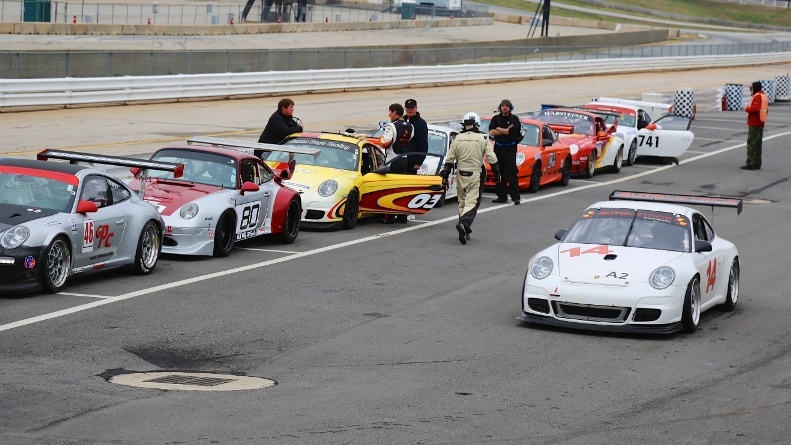 The next PCA race on our calendar is the inaugural event at Circuit of the Americas (COTA) on May 10-12. It will be the first opportunity for most drivers to run on a Formula 1 circuit, and we are all looking forward to it. 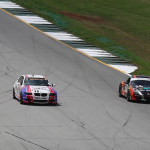 In the mean time, we will be heading back to Road Atlanta with David Baum for the Grand Am CTSCC event in a few weeks.